Ervamatin Shampoo cleanses the scalp and hair, helping to combat excess sebum, one of the main causes of dandruff and female hair loss. The unique and special formula leaves the hair soft and shiny, with a natural appearance and a pleasant scent. 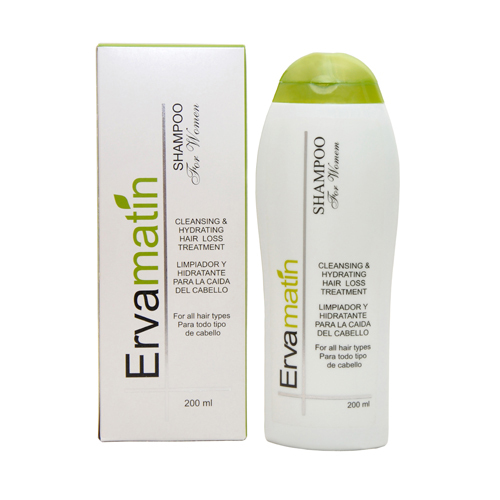 Ervamatin Shampoo helps to control frizz and makes the hair much more manageable because it acts directly on the nutrition of the hair roots and along its length. It can be used on all types of hair. In extreme cases of hair loss, Ervamatin Capillary Lotion is recommended for maximum results. Can be used daily or 3 – 4 times a week. Apply to the wet hair and gently massage the scalp for 1 or 2 minutes. Rinse and repeat the process if necessary. In extreme cases of hair loss, Ervamatin Lotion is recommended to maximize the results.